Who is Molly (Mollie) Lewis (1858–1940)? Finding an interesting gravestone makes me wonder about the person buried there. 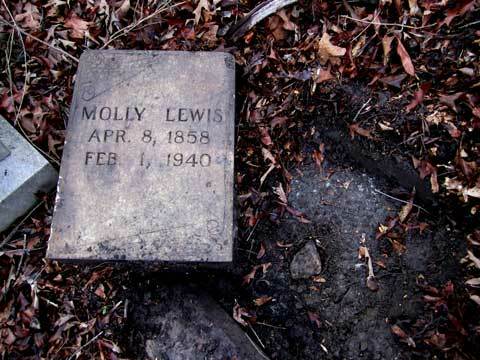 In this case, Molly (or Mollie) Lewis' gravestone was buried almost six inches deep, and just uncovering it wasn't enough. It was face down. After my sister and I managed to turn it over, I saw that its design matched an adjacent marker's design; this one belonged to John Riley Pierce (1858–1940), who is probably her cousin—or maybe more. Read on. In 1891, John R. Pierce works at Atlanta Cotton Mills. This is the John Pierson [sic] who later lives with Mollie Lewis and is a grinder at a cotton mill (Atlanta City Directory). In 1896, Molly Lewis is the widow of W. B. Lewis. She boards at 193 Davis Street (Atlanta City Directory). Mollie Lewis lives on Piedmont Street in Atlanta. She is a widow, age 40. She shares an address with her brother, John R. Terry and his wife and child. Mollie's occupation is "household sewing." Her brother John R. Terry is a grinder at a cotton mill. I suppose her maiden name is Terry. In 1902, John Pierce lives at 201 Marietta Street. He is employed by Atlanta Cotton Mills. In 1905, she lives at 201-1/2 Marietta Street, She is the widow of William Lewis (Atlanta City Directory). In 1908, she lives at 201-1/2 Marietta Street, She is the widow of William Lewis (Atlanta City Directory). The census shows a 48-year-old Mollie Lewis as a widowed head of household on Marietta Street in Atlanta. Her married name is Lewis, and her maiden name is Terry. Living with her is her cousin John Pierson [sic], who is 50. She is a dress maker and he is a grinder at a cotton mill. He is single, so this has the makings of an interesting household. In 1913, she lives at 201-1/2 Marietta Street, She is the widow of William Lewis (Atlanta City Directory). On the 1920 census, Mollie is the head of household—a seamstress living on Marietta Street in Atlanta. John Pierce is a "boarder" who works at a pool hall. She's 59 and he's 61. She is listed as a widow. This is the former Mollie Terry. In 1921 Mollie lives at 201-1/2 Marietta Street. She is the widow of William Lewis (Atlanta City Directory). On the 1930 census, they're both 72 years old, so in the ten years, she aged 13 years and he aged 11 years. Now, they're on Walton Street in Atlanta, and he is head of household and she is a lodger along with several other lodgers. He is a manager of a boarding house and she is still a dress maker. Both died about 10 years later. The 1940 Atlanta City Directory shows that Molly and John live together at 219 Walton Street. The data was probably compiled in 1939, because the 1940 Census shows that 219 Walton Street is occupied by someone else. The 1940 Census count was done in April. Mollie died on February 1. Her death certificate (Georgia 3853) shows her name as Mallie Lewis. 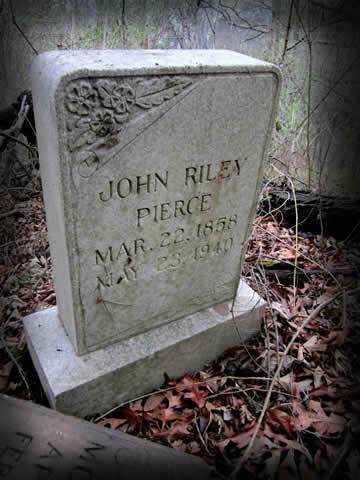 John Riley Pierce died on May 23, 1940, just weeks after the census count (Georgia death certificate 13832). In 1940, they were buried side by side at Hollywood Cemetery.